The changing nature of the family is a topic of intense public concern. It also has been the focus of research in sociology and related disciplines for many years. 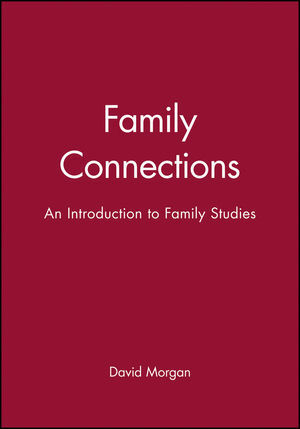 Family Connections is a major new introduction to the study of the family, written by one of the leading scholars in the field. Morgan shows that the study of the family is not a peripheral concern of sociology but rather lies at the heart of sociological theory and research. Family Connections takes the reader through the established debates, such as the relation between family life and the world of work and employment, the impact of class and stratification on the family, and the relevance of gender. Morgan then examines some newer areas of social inquiry, including the sociology of the body, time and space, food, and the home. The relevance of the family to more general topics of sociological theory such as postmodernity, citizenship, consumption and risk are all discussed.The emphasis throughout is on family relationships as processes which are fluid, complex and open to change. This timely, wide-ranging and innovative book will be of great interest to students and scholars in family studies, sociology, and gender and women's studies. David Hopcraft John Morgan, known as David Morgan, is a British sociologist, a former President of the British Sociological Association and editor of the association's journal Sociology. His research focuses on family sociology, gender studies and especially men's studies. 1. Work, Employment and the Household. * This is a clear and up-to-date textbook on the family, written by one of the leading scholars in the field. * It covers the long-established debates, such as the changing nature of the family and the relation between family life and the sphere of work, and new areas of investigations, such as the sociology of the body, time and space, food and home.